Spearpoint 1943 Eastern Front continues the fast-paced two-player tactical card wargame action set in WWII on the Eastern Front. 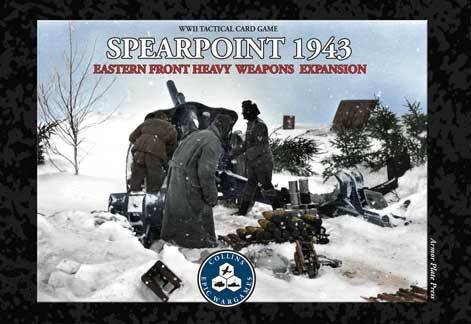 For even more deck construction options, add the Heavy Weapons Expansion to Spearpoint 1943 Eastern Front. The HWE brings heavy German and Soviet Artillery, heavy tanks, and tank-busting planes and bombers to the front. 25 total German Unit Cards and 25 total Soviet Unit Cards add to the fun of Spearpoint and will keep your oponents guessing about just what may be in your Reserves Deck. Find out more about this game under Details. 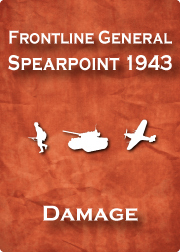 The Spearpoint line is a series of WWII tactical card games focusing on battles between US, German, and Russian forces in Italy and on the Eastern Front during 1943. The Eastern Front set is a new standalone game in a compact box which allows for easy transport to your next gaming night. Inside that box, you’ll find 185 cards, four d10s (two grey and two red), tracking counters, and the rules and scenarios booklet. The cards are broken into four decks: 55 cards make up the Russian deck, 55 for the Germans, 50 Command cards, and 25 Damage cards. The Russian and German cards are called Units and they include equipment such as tanks, guns, self-propelled and fixed artillery, aircraft, infantry, and the crews required for certain equipment. The Heavy Weapons Expansion adds 50 additional Unit Cards for more deck construction options. A Standard Game begins with each side choosing cards totaling 80 to 100 points, which makes up your Reserves Deck. The remaining Unit cards are placed to the side as they will not be used. Each side has a large number of points worth of unit cards to choose from so you have loads of choices regarding deck construction. Unit Card point values range from 2 points for a crew to much higher point values for more expensive and powerful units. These point values are also their value to the opposing side if destroyed or captured. Once you have constructed your deck, you’ll choose four Unit Cards to keep as your starting hand, Shuffle your remaining Reserves, and draw three Command cards. Starting forces begin in your hand and the rest make up your Reserves. At this point the first Commitment Phase begins. You may commit up to your entire hand during any Commitment Phase, which effectively brings units into the Battle Area and into engagement range. 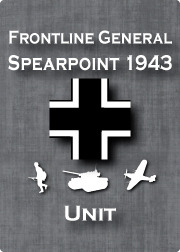 Committed units come into play either on the frontline or the rearline, as indicated by the Unit Card under the Unit's Title. Frontline Units typically include infantry, tanks, short range guns, etc., while Rear Line Units may include Artillery or Self-Propelled Guns. Aircraft are not committed to a line, but rather, come into play for a set number of turns based on their actual fuel capacity. Multiple lines provide a sense of depth and allow for breakthrough actions with aircraft screaming overhead. The Combat Phase begins by each player simultaneously declaring the targets of each of his Units in play. 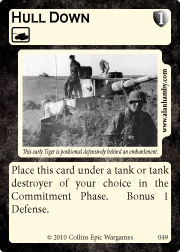 To do this, players simply point each card toward its intended target within the restrictions of targeting (or use the included tracking counters in the Eastern Front set). For example, each Unit Card has one or more weapons listed. If an attack value is given for that weapon that corresponds with the Unit Type Icon, the attack is legal. Once targets are set, each player rolls a d10 for Initiative. The highest roll will attack first with one of their units. Since damage is instantaneous (i.e. you can destroy a unit before it has a chance to fire), Initiative is an important roll. Attacks alternate from there until all previously declared attacks are resolved this Combat Phase. To hit a target in an attack, the attacker will roll 2d10, adding or subtracting any modifiers, sum the result, and compare it to a hit number provided on the attacking unit’s card under the weapon in use. Most units have more than one weapon that can be used and you’ll choose which to use based on target type: infantry, artillery / armor, or aircraft. Each Unit may fire 2 weapons per turn against a single target. There are rules for critical hits (sum of 18, 19, 20) that result in extra damage or instant destruction. If the attack is a hit, the Intensity of that attack (representing how well-placed the shot was) is determined with a d10, which is added to the base damage factor of the weapon that scored the hit. The defense value of the target is subtracted from the total damage and what is left is applied to the target's Endurance. Each unit has an amount of damage that it can sustain and if the break number is reached (normally half of the full Endurance) a Damage Card is drawn and the extra effects are applied to the target. It’s important to at least reach that break number when you attack a unit because damage points do not carry over from turn to turn. In other words, damage in a turn is cumulative but once that turn is over the target is either damaged (and marked with a Damage Card) or returned to full strength (with damage shaken off). Combat and damage resolution moves smoothly after a few turns. At first, it may seem confusing, but you’ll get the hang of it and the pace of the game definitely speeds up - especially as things begin blowing up. The Final Phase of each turn is called the Draw Phase. Players each draw a single Command Card from a common deck, and then choose to draw any two additional cards - these can be two Unit Cards, two more Command Cards, or one of each. Command Cards are used when appropriate (according to the card) to throw a lot of wrinkles into the game. You may receive bonus modifiers for Defense, Attack, or Intensity, or use them to perform special Command functions such as withdrawing a unit, searching in Reserves for a unit you need in Combat right away, or drawing more Command Cards. In addition, a maximum of 1 Command Card may be discarded (burned) prior to rolling any roll in the game to influence the roll's result by +1. This way if you draw a Command Card that is only good for Aircraft but have no Aircraft in your Reserves Deck, you still have a use for that card. 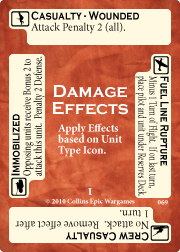 Damage Cards have effects for each of the four unit types and are designed to be placed under the damaged unit so the appropriate effect is shown. These add a lot of flavor to what happens during battles so you’re not just sitting there pinging hit points away from units without any sort of reduction of effectiveness. For a Standard Game, which represents a meeting engagement, the victory conditions are very simple. The first person to score 51 points worth of destroyed (or captured) enemy units or to be left unopposed by any enemy units for three consecutive turns is declared the winner! Scenario Games are another way to play Spearpoint 1943 Eastern Front. Scenarios provide a specific setup, including specific objective-based Win Conditions, the potential to score bonus points for achieving secondary objectives, and more. Scenarios typically restrict the types of units that can be put into a Reserves Deck and provide players with special rules and some forces in play at the start of the battle. All Scenarios are available for download and are included in the Eastern Front Rules and Scenarios booklet. Once you have a handle on the rules you should be able to play through a Standard or Scenario game in about 30 minutes making this an uber wargame filler! 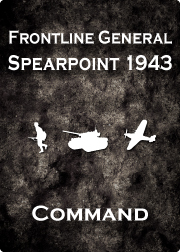 For even more depth using the same core Spearpoint 1943 Eastern Front combat rules and components, check out the Map expansion for Spearpoint 1943 or Spearpoint 1943 Eastern Front. Ready to play? Go to the Downloads tab and get the free Print-and-Play Combat Demo. We fully support our games. 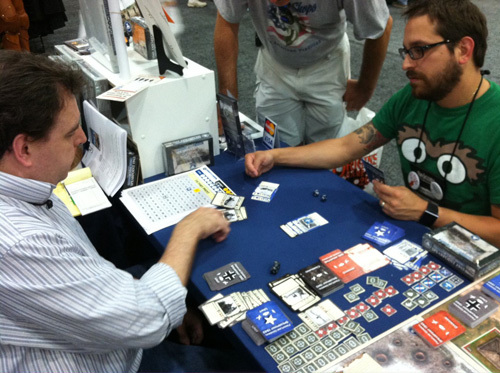 If you ever have any questions about how to play, please get in touch with us through the game's forums on Boardgamegeek.com or direct by e-mail. Please refer to the Spearpoint 1943 Eastern Front game page for downloads related to the Eastern Front / Heavy Weapons Expansion games. We will post external review links once available. We will add images of the Heavy Weapons Expansion soon. Below are frequently asked general questions about this game. Q: Is this a standalone game? A: No. This product supplements the Spearpoint 1943 Eastern Front game and one copy of that game is required. Q: Is this a collectible card game (CCG)? A: No. Everything you need is in the box and all boxes are the same. It is however expandable. All cards are compatible with each other. Q: Where can I purchase this game? A: You may purchase this expansion In our online store directly (we ship worldwide) or through many US and international retailers.